Trevor Pateman's Philately Blog: Russia 1917 Imperial Arms 10 Rouble Imperforate: When and Where was this stamp distributed? Russia 1917 Imperial Arms 10 Rouble Imperforate: When and Where was this stamp distributed? There is a certain fascination in Top Values - and from 1906 until 1921, Russia's top value was the 10 rouble Imperial Arms stamp in red with a yellow background and a grey centre. In contrast, the 10 rouble imperforate, printed in 1917, is a scarce and rather mysterious stamp. - or for that matter, most of Russia "proper"
In Baku, the stamp was used after independence but prior to the introduction of the "Musavat" pictorials. I don't now have a copy but in the past ten years or so have, I think, sold two examples. 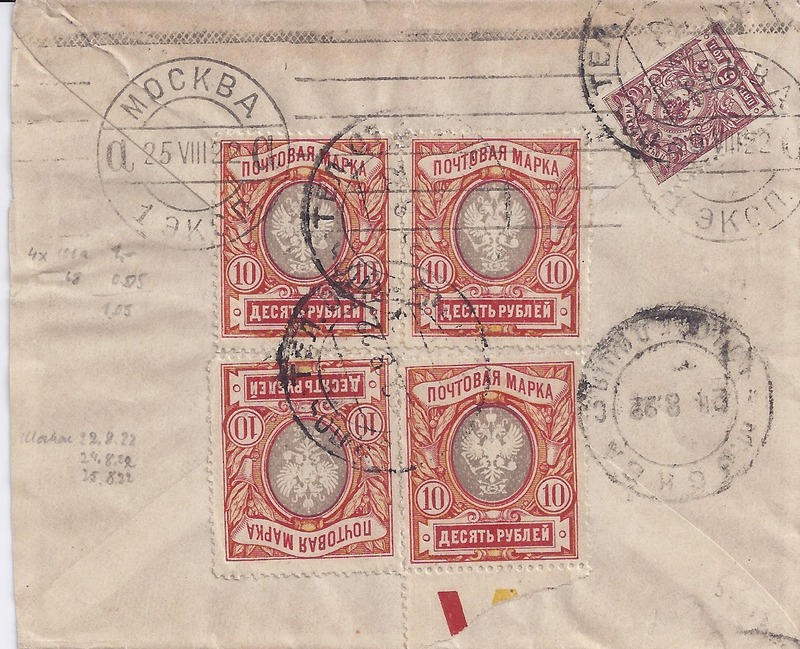 The top left stamp is cancelled ODESSA 8 12 17 and this is the earliest date I can record for use of this stamp. Odessa at this time was a "Red" (Bolshevik) city. Below this stamp is a divided pair cancelled KHARKOV 4 4 18, the earliest date I have for use there - I have 15 more stamps cancelled at Kharkov between May and July, some of which I think are cancelled to order. Kharkov was a "Red" city until the Bolsheviks surrendered to the Germans on 9 April 1918. Below the Kharkov stamps is a copy cancelled SUMY KHAR[kov] also in April 1918. I have seven more copies used at Sumy in April and May, which leads me to think that Kharkov passed on some of its stock to other offices in its postal district. Then there is a copy on a formular fragment used at LOKHVITSA POLTAVA 1 3 18 - the fragment is signed Z.MIKULSKI - so earlier than the Kharkov district stamps. As in the Sumy case, tghe use of this stamp at Lokhvitsa indicates that the Poltava main office passed on some of its stock to other offices in its district. 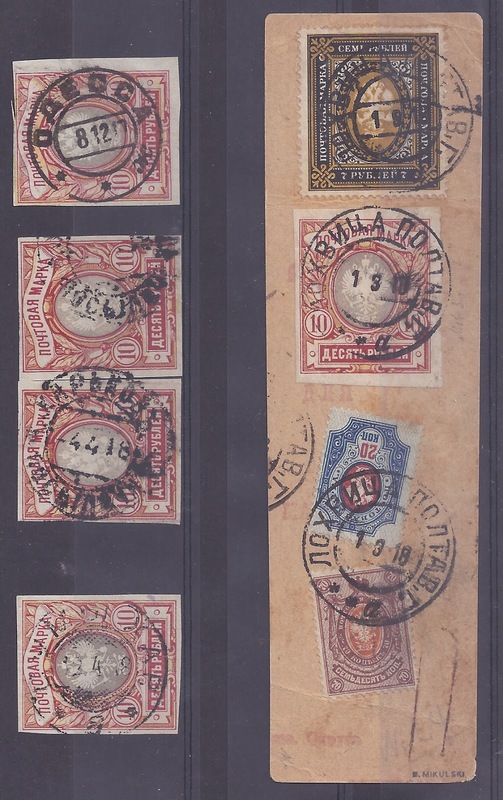 The stocks in these three districts - Odessa, Kharkov and Poltava - were clearly quite large as the stamps can also be found (and not as rarities) with Trident overprints of those districts applied later in the year (probably August - September). Kyiv and Podillia Tridents on 10 rouble imperforates are listed in the Seichter and Bulat catalogues but they are rarities and do not lead me to conclude that there was a regular distribution to these districts. I do have a 10 rouble cancelled KIEV 29 6 18 but this is cancelled to order and could have been brought to the counter. But it's possible that Kiev got a small allocation of the 10 rouble stamp. But what I would like readers to show me (scans to trevor@trevorpateman.co.uk) is clear evidence of the distribution of these stamps to other postal districts than the four I have listed.